The relationship between the policy of brinksmanship and the film Rebel Without A Cause noted by Bertrand Russell in his essay proposing the variation on Prisoner's Dilemma known as "Chicken," recalls a more general observation made by Richard Slotkin. Slotkin observed that US policy planners and Hollywood scriptwriters drew upon the same "mythologies" in the formulation of their scenarios. Rio Grande thus appears to be in some sort of dialogue with history. Film and event "speak" to each other--event lending political resonance to the fiction, the fiction providing mythological justification for particular scenarios of real-world action. They did so in the first instance (1950) not because one necessarily caused or influenced the other, but because the conceptual categories which shaped the scenarios developed by both movie-makers and policy-makers were drawn from the same cultural lexicon, the same set of mythological models. 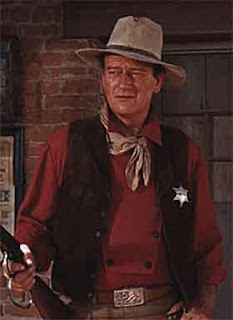 But once the "cult of the cavalry" was established as a major division of American mythic space and was seen to be responsive to the course of political events, its fictive rationales and heroic styles of action (especially as embodied in the symbolic persona of John Wayne) became functional terms in public discourse and symbols of the correct or heroic response to the challenges of the Cold War (Slotkin, Gunfighter Nation). Slotkin adds that an entire complex history is condensed into an emblem consisting of John Wayne in his cowboy persona associated with a motto (the right man with a gun). The emblem communicates in a flash (flash reason) US counterinsurgency strategy from Vietnam to the present. The fact of this conjunction suggests a heuristic device: to use popular narratives as probes to locate the fundamental values (the common scenarios) motivating decision-making in individual and collective situations. The instruction is to explore such a connection with our Target disaster, keeping in mind that we are documenting an aspect of Contrast.